Helping You Find Your Way Home! (BPT) – No matter where you live, the weather can be unpredictable any time of year. Storms can disrupt your family’s routine, but a little preparation can mean reducing the stress that unexpected weather events can cause. Preparing for storms or other weather conditions just takes a few practical, proactive steps that can save you time, money and give you peace of mind. Prep your family. Make sure everybody in the family is equipped with everyone’s phone numbers (not just on phones), in case batteries go dead or service is inaccessible. Create a practical plan for what to do if school buses are delayed or canceled, or if Mom and Dad can’t get home from work on time. Designate safe places for everyone to go or meet in the neighborhood during a weather emergency. Make sure older children who may be home alone know where to find emergency supplies such as flashlights if the power goes out before parents can get home, so they feel confident about handling any unexpected situation. Prep your car. Invest in the best tires, and ensure that they’re in tip-top condition to protect you and your family during icy or snowy weather. Check your tire pressure to make sure the PSI is at optimal levels recommended by your vehicle’s manufacturer, since tire pressure can decrease around 1 PSI per every 10 degrees the temperature goes down. Make sure you have a good spare tire. Keep your vehicle gassed up when temperatures are colder, to prevent gas line freezing, and make sure you’re caught up on maintenance such as oil changes, safety inspections and manufacturer recalls. Make room in your trunk for emergency supplies like jumper cables, a first-aid kit, blankets and a safety flare, in case you are stuck in your car for any length of time. Prep your home. Feel ready for any weather conditions by assembling an accessible emergency box, complete with flashlights and spare batteries, bottled water and non-perishable food, plus a first-aid kit. Then, be prepared for power outages due to weather events by investing in a generator. 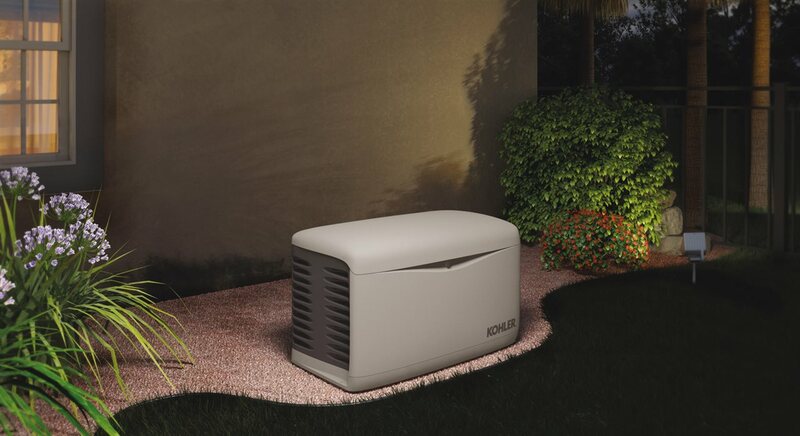 Automatic standby generators from Kohler are permanently installed outside a home, similar to a central air conditioning unit. The generators connect to a home’s electrical system and run on natural gas or propane. When power is lost, automatic standby generators turn on within 10 seconds, even when nobody is home, and units can be remotely monitored from a smartphone or laptop. Larger generators can power everything from lights and HVAC to sump pumps and home security systems. Smaller units can power a few key circuits. For more information on generators, visit www.kohlergenerators.com. Having a generator can prevent a host of inconveniences, from food spoilage and lost communications to loss of heat and lighting. Thinking ahead before the unexpected happens saves time and money — while relieving your worries — during any kind of storm. Being prepared is worth the investment, offering you and your family peace of mind. You may not be able to control the weather, but you can absolutely control how you prepare and respond to it, no matter what the forecast.